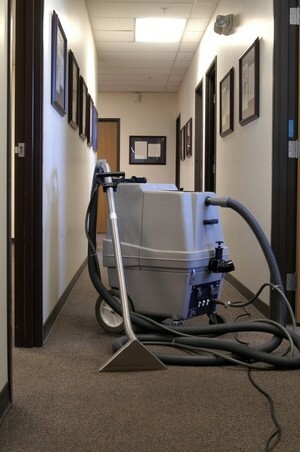 Looking for a contractor to instill a commercial carpet cleaning and maintenance schedule? Offices encounter a lot of heavy foot traffic daily, which needs to be treated on a regular basis. Having clean, fresh smelling carpet is essential to maintaining a happy, healthy work environment. Vacuuming on a regular basis goes a long way in protecting your carpet's fibers from the grit that gets tracked in and acts as sandpaper when walked upon. But having your commercial carpets deep cleaned on a regular basis will release that ground in, embedded dirt that vacuuming alone can't handle. Call Gold Star Services for a free assessment on keeping your commercial carpet clean and healthy. The highly skilled staff at Gold Star Services can provide you with just that......fresh, clean, healthy carpets. Gold Star Services offers the best professional carpet cleaning methods and products to help maintain and extend the life of your carpet, leaving your carpets clean and fresh, and your staff happy and healthy. Gold Star Services will happily evaluate your needs and work with you and your scheduling to find a suitable time to have your carpets cleaned at very affordable rates. With Gold Star Services, you can provide your staff with a clean, healthy work environment, while remaining on a budget. Call Gold Star Services now.